A talented sport journalism student has won a top award for his football blog at a prestigious national event. 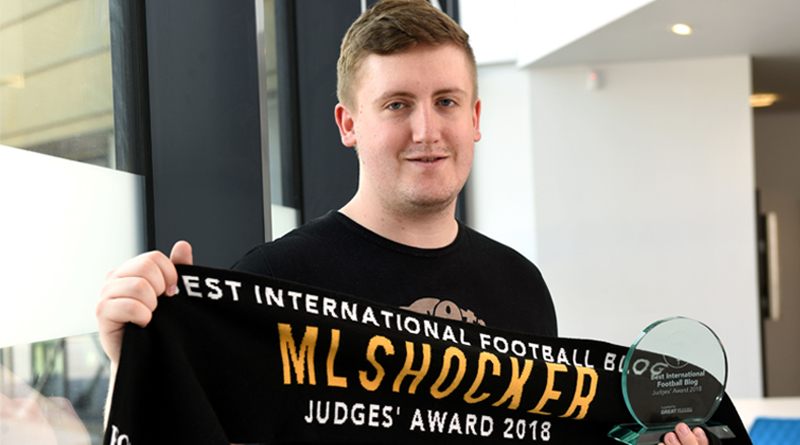 Luke Beaumont, who is in the second year of his degree at Teesside University, won the Best International Football Blog award for his website, Major League Shocker, at the Football Blogging Awards. Now in its sixth year, the awards celebrate the stars of the football content creation industry, whilst also paving the way for new and up-coming-talent. A total of 21 awards were up for grabs on the evening with categories ranging from Best Gaming Football Content Creator, to Best Football Podcast. The ceremony took place at Alexandra Palace in London on 17 May and recognised a number of individuals and teams, with the winners chosen by fans and judges. This year over 200,000 votes were cast by members of the public. Luke, 20, started Major League Shocker in 2016 as a small project to run alongside his degree studies and manages the website and Twitter account singlehandedly. Focusing on Major League Soccer in the United States, Luke’s blog brings a British perspective to the American league. He was both surprised and delighted to win the Best International Football Blog this year. Luke said: “I am amazed at how things have gone so far. I have built up a large following of friendly and intelligent MLS fans who welcome my opinions with open arms and I appreciate that so much. “The category in general was extremely strong. I didn’t for one second believe that I would be travelling down to Alexandra Palace in London to pick up the award. Luke will commence the final year of his studies in September and he’s already thinking about what the future holds. Originally from Huddersfield, Luke has ambitions of living and working as a sports journalist in the United States. “I wanted to make myself stand out in America which is why I chose to blog about Major League Soccer – it was unique and not something that anyone else was doing in this area,’ Luke explained. Paul Bailey, Senior Lecturer in Media in Teesside University’s School of Computing, Media & the Arts, said: ‘I am delighted that Luke’s hard work has been recognised at these prestigious national awards. I am sure that this will provide Luke with an excellent platform for the future.